Preface: I love pre-loved books. I would much rather buy or trade for receive a used book than spend on a new one, for several reasons (economics, history, trees, to name but a few). But the reality is, sometimes I just can’t find what I’m looking for. Whether it’s the local used book store, mini free library, coffee shop exchange or the public library, sometimes I’m just out of luck. Recently, when a colleague was searching for a library copy of The Immortal Life of Henrietta Lacks (Rebecca Skloot), I remembered seeing it on a coffee shop book shelf waiting for a new home. But by the time I knew who wanted it, it was too late. And she really didn’t want to buy a book she was going to read and be done with in a matter of weeks. So I started scouring these locations in the hopes of finding it, and that’s how the idea for yyc book swap was born. How it works: Using the hashtag #yycbooks, announce whether you have a book you’d like to give away or trade, and/or what book you’re looking for. We’ll retweet it for you and, if one of our followers wants the book you’re swapping/has the book you want to read, the two of you make plans to swap. The swap: Social media can be a wonderful tool. In the hands of book readers, you can do about anything. Once you’ve discovered another reader who wants to share with you, the rest is up to you. You can mail your book, drop it off at a determined location, or take a bold step and meet the other reader for coffee to discuss books! Looking for an impromptu book club? Or a review of a book you’re looking to read, share it on #yycbookswap and make it happen. And that’s it! Read, share, swap, meet. Simple. 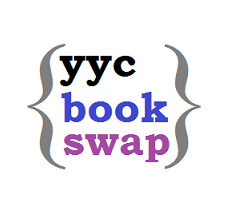 Use the hashtag #yycbookswap to swap books and see what’s available.